Is your sweetie feeling down in the dumps and less than impressive? 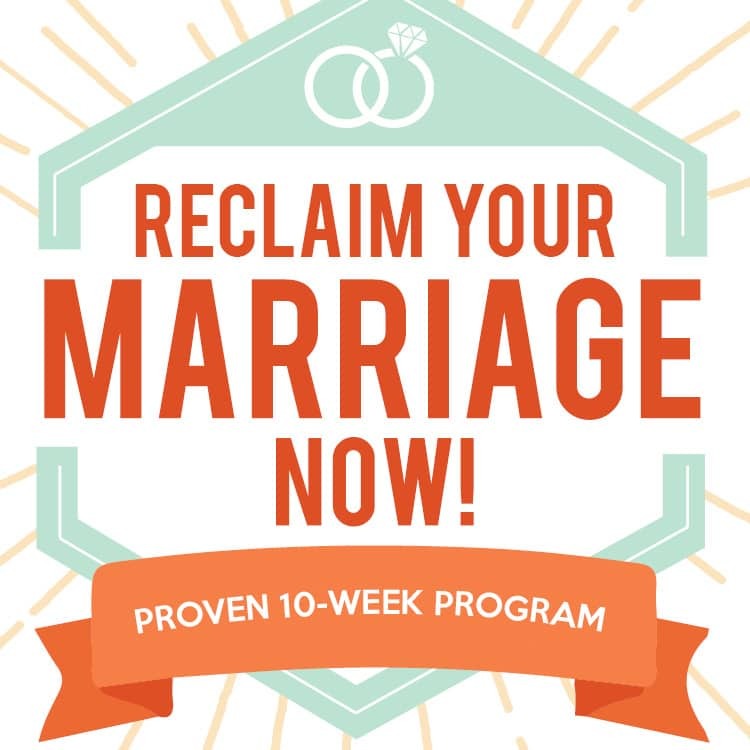 Maybe your better half is sick, your relationship is in a bit of a rough patch, or the two of you are more stressed than serene. Whatever the case, we have the perfect solution! 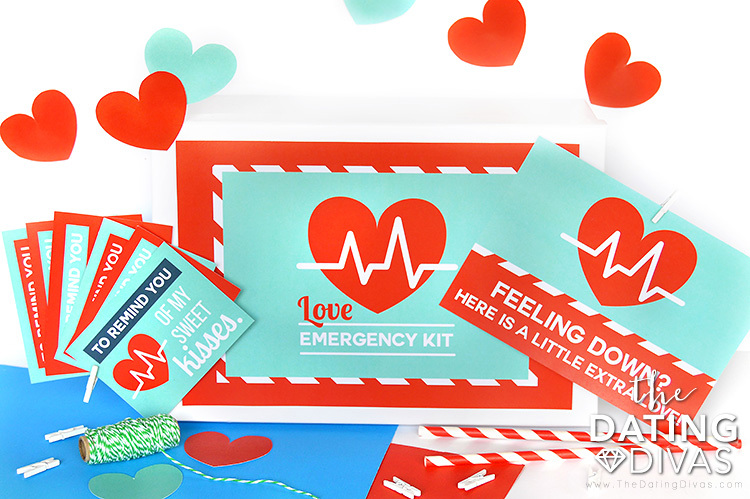 Our Love Emergency Kit makes a fantastic surprise gift for husbands or wives and is oh-so-easy to use (not to mention super fun to assemble)! 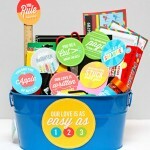 This Love Gift Box is part candy box, part love letters, part gift box, this is truly one surprise gift that keeps on giving and will perk up your love life (and your lover!) in no time at all. 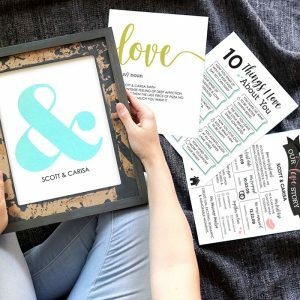 But before we take a look at this snazzy little love gift, we have to give a shoutout to Courtney from Paperelli for designing such wonderful printables for us! 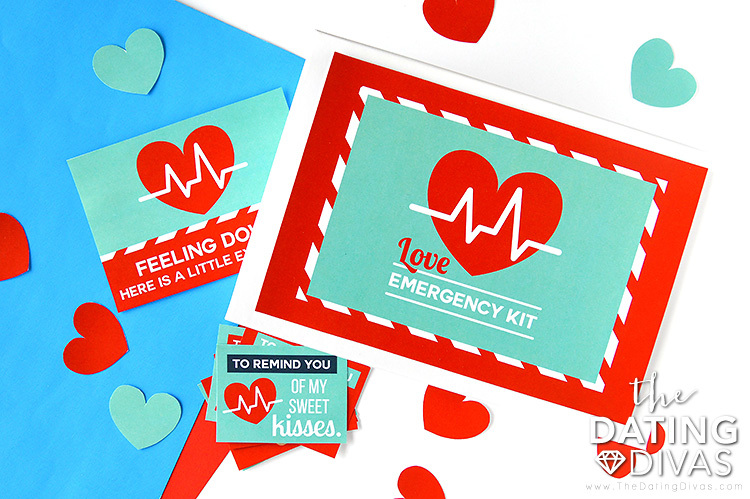 She did a fantastic job and definitely made the Love Emergency Kit a reality. On to the good stuff! While expected presents are totally awesome, we think there’s something extra special about a surprise—this gift definitely fits the bill. Everything can be created on your own timetable and the entire gift is small enough to not raise any suspicion from your sweetie. 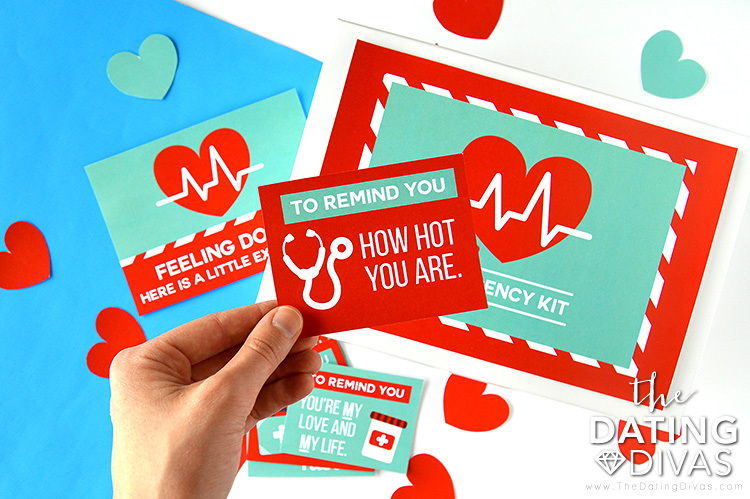 Not only that, but each item placed inside the box is simple, affordable, and bursting with “I love you’s.” Plus the overall medical/emergency design is nothing short of adorable and puts a whole new spin on the classic “get well soon” idea! We call that an absolute win. 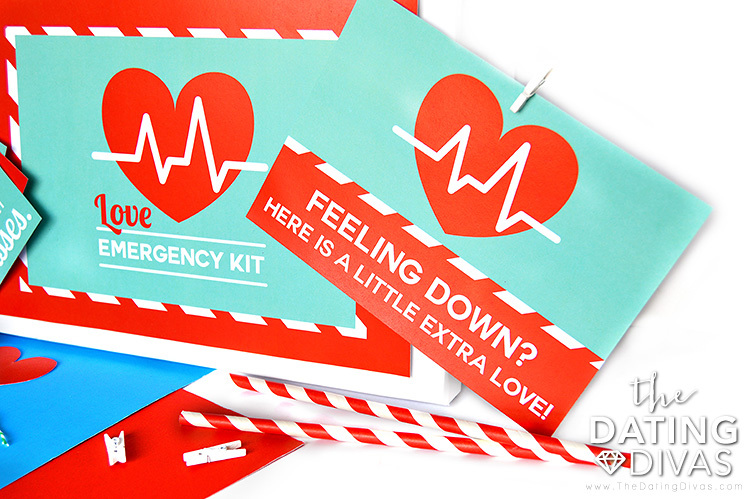 Creating your love emergency kit is easy breezy and we’ll show you just how it’s done! 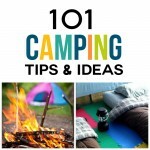 Step 1- Print the downloadable pack at the end of this post. It contains everything you need to craft your one-of-a-kind box of special gifts for your Husband (or Wifey!). 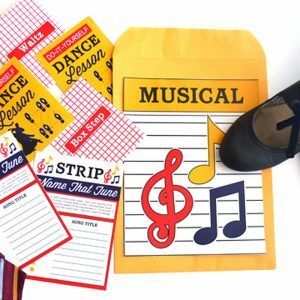 We love using high-quality cardstock with our printables to make them more durable. Step 2- Cut out each individual item (hint: using a paper cutter will make this step a whole lot faster). Included in your pack are a box cover, note insert, printable gift tags (ie. those DARLING miniature love letters we talked about! 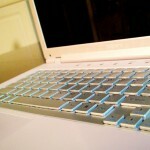 ), and a set of heart-shaped embellishments to really help take things to the next level. Step 3- Find a box roughly the size of a shoebox. Affix your box cover and you are well on your way to making your surprise gift box of love a reality! At this point, you may choose to use those embellishments to add some more pizazz to the inside or outside of your box, but feel free to use them later or in a different manner. 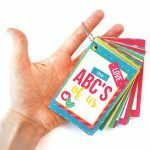 Step 4- Each of your printable gift tags contains a super sweet message of love that will be attached to a particular gift item. While you certainly have the option of choosing your gifts, we’ve come up with a few sweet and simple ideas to make your job even easier. 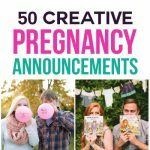 Take a look at the list below for ideas to stick on those sweet little love letters or keep reading as we help you put on the finishing touches! 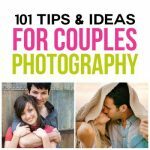 Save these steps on your Pinterest board now! Each set of text is the quoted wording that appears on that particular tag, followed by the suggested gifts. To remind you I’ll always stick by you! A stick of gum or pack of stickers would be perfect sticky gifts for this tag. To remind you of my sweet kisses. 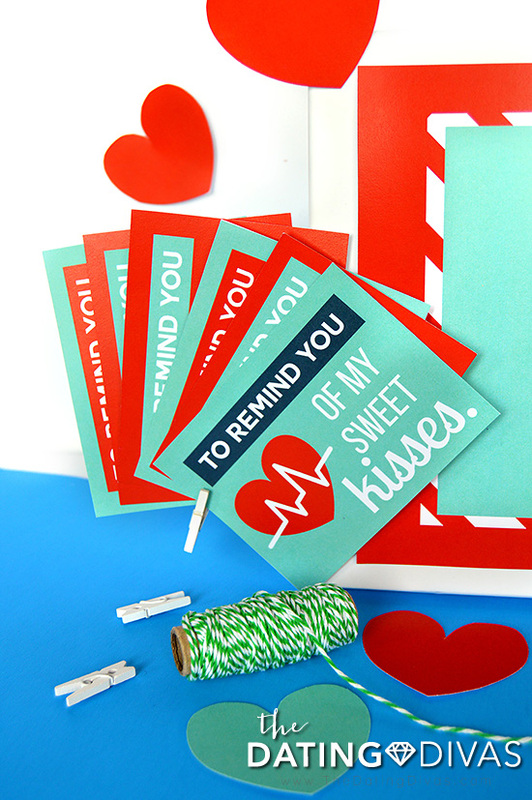 A tube of chapstick or a handful of Hershey’s Kisses (remember, it’s part candy box!) will certainly help seal the deal! To remind you you’re My love and My Life. To remind you how attracted I am to you. A fun magnet or handheld mirror are great options for this little guy. To remind you how hot you are. Anything that raises the temperature will work! A pack of Red Hots or a new pair of sunglasses are ideas worth an A++. Not much explanation needed here! A new pair of soft, cozy socks will get the job done. Once you’ve gotten your nifty-gifties together, you’re practically done-zo! Just attach each tag to your gift of choice, pack everything inside your box, top with the note insert, and pop on the lid. How sweet and simple is that?? The only thing left for you to do is present your truly fabulous surprise gift box to your sweetie and watch them unpack the love. Pin this idea and use it for later! 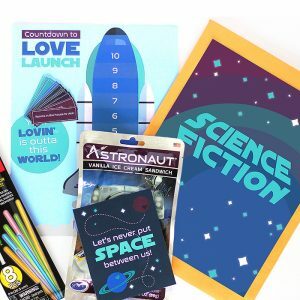 For even more romantic ideas, be sure and take a look at our Emergency Romance Box and our Spouse Sleepover Date! They'll get the love going in no time! This is the sweetest!! I think I’ll prep it NOW and hide it so it’s ready whenever he’s having a really rough day or week. Thank you! I love this idea. Becca, prepping ahead of time is SUCH a great idea! 😀 Thanks for your comment, sweet girl! I really like this idea, plus it is perfect for us as my husband is a paramedic and the whole emergency thing really fits with our life due to his career.